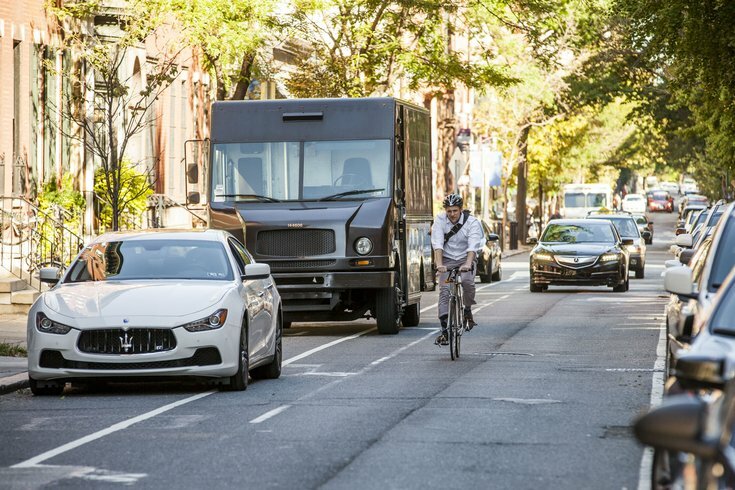 A cyclist navigates around vehicles parked in the bike lane on the 1800 block of Spruce Street. The already-contentious battle over the Spruce and Pine streets bike lanes got even more heated this week. The project originally slated to begin this fall involved switching the lanes to the left-hand side of the street, installing delineator posts at some intersections and painting the lanes green, however the renovations have been postponed to this coming spring, PlanPhilly reported. The lanes are some of the most widely-used and were formerly considered some of the safest in the city. But when Emily Frederikson was killed on 11th and Spruce streets in November 2017, the sentiment changed. After public outcry following her death, city officials in April proposed switching the lanes from the right side of the street to the left in an effort to cut down on vehicles making dangerous "right hook" turns that cut off cyclists riding in right-side lanes. These new changes will (eventually) swap not just cycling lanes, but also parking and loading zones for short-term parking and deliveries. It will also include new turning lanes. It seems as though things are still in the planning stages two years after the city was awarded federal grant money to upgrade lanes across the city. And why? Apparently, analysis of the streets took longer than expected, and now, with fall on the way, officials don't want to start repaving streets — which will coincide with the lane switch as the weather gets cooler. “This is a really important project, and rather than doing it quickly, rushing, we'd rather do it right,” Christopher Puchalsky, policy director in the city’s Office of Transportation and Infrastructure Systems, told PlanPhilly. A GoFundMe was created on Tuesday by a user called Protected Bike Lanes after the news broke the project was delayed. It's raising funds for delineator posts that will be installed independently of the city, according to the campaign's description. As of Wednesday afternoon, it had $160 of its $10,000 goal. "We 100% expect the streets department and oTIS to take these down," the fundraiser page reads. "We will not relent. We will no longer go unprotected and we will no longer take their lame excuses that they want to 'do it right.'"